You're probably not even aware you're doing them, either. Driving in the car can be so relaxing... unless you’re on a road trip from hell with someone whose habits on the road get under your skin. What is it about being in a car that can set a person’s nerves so on edge? Well, according to a new survey by NetQuote, plenty. Everything from the air temperature to the distance from the vehicle in front of you is enough to get even the closest people riled to the point of anger. 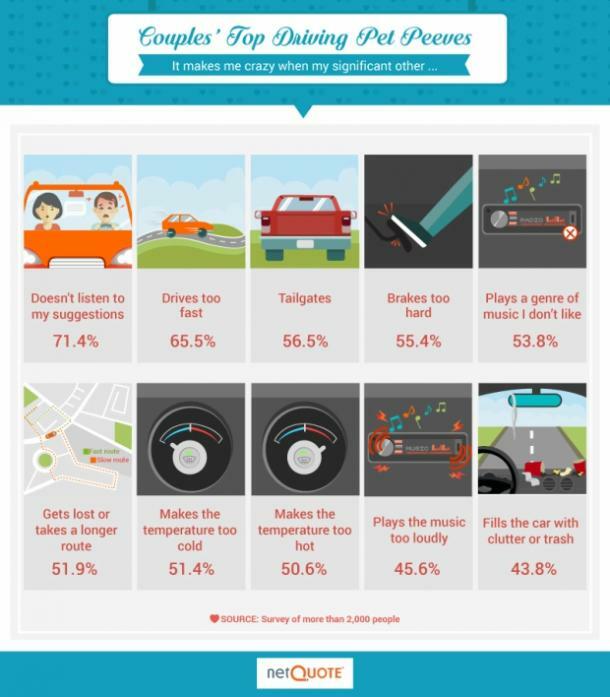 So what exactly are the biggest turn-offs while driving? NetQuote asked 2,000 people what their top roadway annoyances are, and they responded in force! Most people’s top-rated pet peeves were similar, but there was a surprising correlation that depended entirely on the closeness of the couples in the car together. It turns out that while not listening to suggestions while driving ranked as the top trigger, the type of relationship you have could make it worse. The survey discovered that the more committed you are in a relationship, the more stressful your partner’s bad driving habits are to you, which isn’t great news if you’re married. In fact, while people who are dating and living separately are only 23.1 percent as likely to describe road trips together as “stressful,” two married people traveling together increase those odds to a staggering 37.2 percent! Given that the average American (ages 20-54) ends up driving around 15,000 miles a year, that’s a lot of time to spend ticked off at the person stuck with you in the car. Other top annoyances in the car included how on edge they get when a partner drives too fast, follows the car ahead too closely, or brakes too hard. Coming in among the least perturbing things your significant other does in the car? Not asking for direction (guys), not using your turn signal, not paying attention, or driving too fast over speed bumps. Surprisingly, despite the fact that in 2013 alone, over 3,100 people died in distraction-related crashes, texting or using a cell phone while driving ranked in fairly low. Only about .48 percent of those surveyed listed it as a driving pet peeve.